We are engaged in Manufacturing and Supplying of good quality Wooden Venetian Blinds. The Wooden Venetian Blinds are made of either brass wood or other hardwoods which ensures its long life and durability. These Wooden Venetian Blinds attributes elegance and charm to the windows of your living spaces. 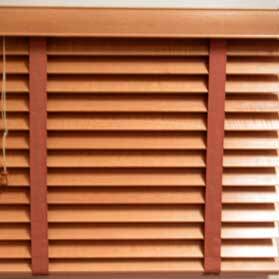 We are offering many colors and shades in these Wooden Venetian Blinds.